Central Square itself isn’t exactly a residential area. Instead, it’s more of a nexus for the four neighborhoods that come together at Mass. Ave: Cambridgeport, The Port/Area 4, Riverside ,and Mid-Cambridge. That unique combination forms the ultimate interweaving of residents—undergrads co-exist with wealthy, baby-carrying hipsters, while homeless people and pharma bros who work in the area walk the sidewalks. Central Square used to be grittier than it is these days, and it’s hard to miss some of the changes that waves of gentrification have brought through. While low-rise chain stores have existed on Mass. Ave. for quite some time, larger companies like Target and Amazon have recently settled in. The Cambridge Police just opened a reporting station right in Carl Barron Plaza (“sponsored by Cambridge Savings Bank,” it proudly boasts), a place where transient folks often congregate. It’s a move applauded by those looking for more of a police presence, and derided by others who see it as just another way of pushing out the existing population that doesn’t fit into the visions of high-end real estate developers. And those developers are certainly looming—huge residential buildings like Mass + Main keep popping up, while iconic venues like ManRay and TT the Bear’s are long gone, the victim of rising real estate prices. Luckily, some iconic nighttime hangouts, like the Cantab, Phoenix Landing, the Middle East and the Field, are still standing. 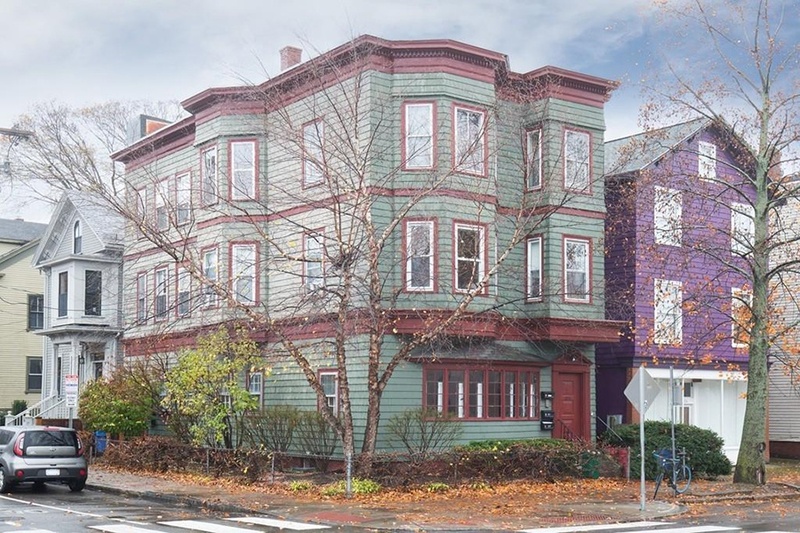 If you’re looking to live near Central Square, it’s safe to say it’s for one of two reasons—either you’re seeking proximity to one of the many institutions in the area, or you want to live somewhere that accurately depicts the diverse lifestyles the city of Cambridge brings together. Kendall Square is squeaky clean—a sea of billion-dollar tech firms encased in glass—and Harvard Square is kind of like Disney World, where everything is beautiful but priced to drain your wallet. But Central Square, despite the recent changes, still manages to have a bit of unpredictability to it. The Central Square Stop on the Red Line. Central Square is one of Cambridge’s five squares, running along the MBTA’s Red Line route. The square’s real estate is comprised of four distinct neighborhoods: Cambridgeport, The Port/Area 4, Riverside, and Mid-Cambridge. The Mid-Cambridge area is very popular, since it’s located close to both Harvard and Central Squares. That said, Cambridgeport is certainly a hot spot right now—but you can pretty much say that (and the numbers say that) about Cambridge as a whole. If a buyer is ready to purchase in the Central Square area, how much work they want to do on a property will be a factor to consider. There is a lot of new construction, as well as properties in need of varying levels of renovation. 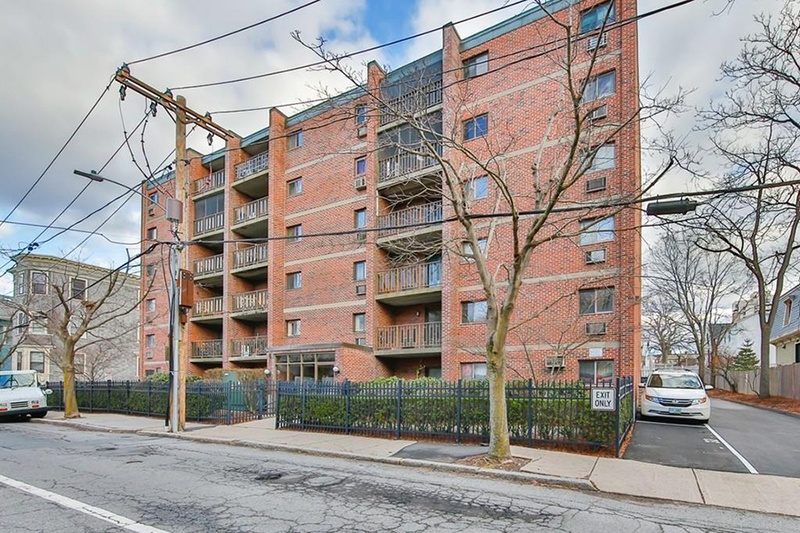 The average price, year to date, for both condos and single families in all these neighborhoods has been one-million plus, with smaller condos starting in the $500,000 range. Like most of Cambridge, Central Square has continued to grow in popularity, and it’s an area attractive to developers. The demand is reflected in the home prices that are steadily rising. 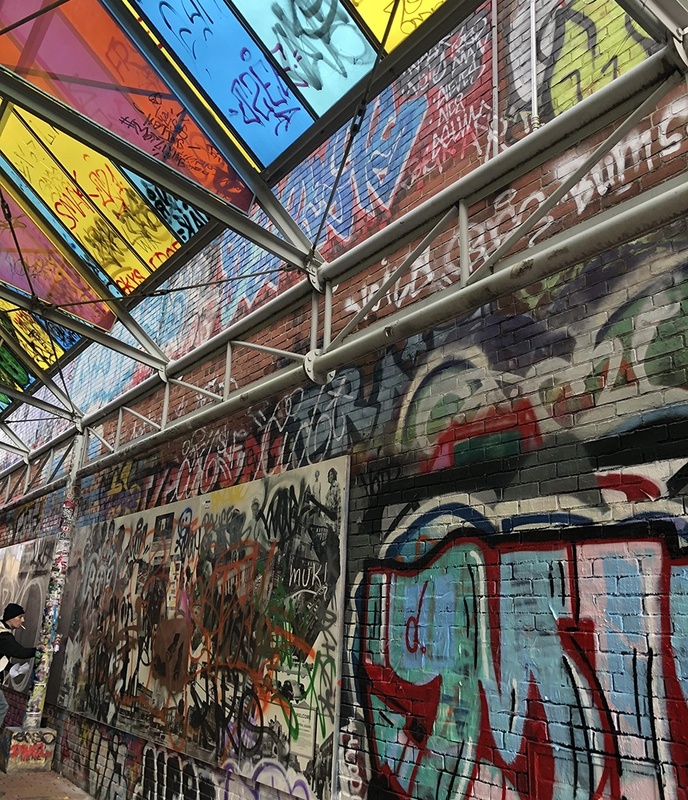 Central Square is filled with public art, from Graffiti Alley to colorful murals on the Green Street Garage. The food scene is great, with plenty of delicious international options like Asmara, Rangzen, and Pepper Sky’s, and healthy spots like Whole Heart Provisions and Life Alive, which gets so swamped you’ll wait a half hour for a $6 Golden Latte. 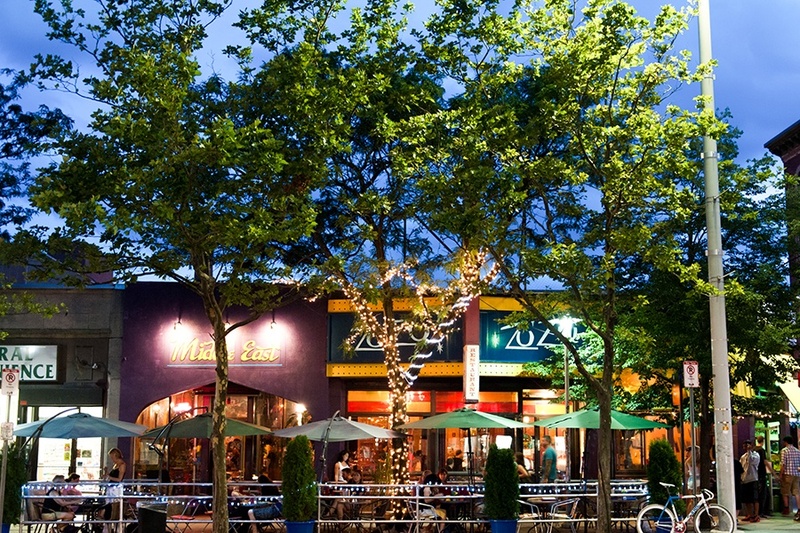 But it’s also become a destination for higher-end restaurants, like Little Donkey, Craigie on Main, and Viale. It’s a unique shopping destination, too—in addition to chain stores, there are longstanding gems like Cheapo Records, Teddy Shoes, and Rodney’s Bookstore, plus bargain spots like Boomerangs. And, of course, don’t forget to grab your free rose from the Central Square Florist if your name is on the placard out front. Moody’s Falafel Palace has been closed for a while, but the iconic building, resembling a small white castle, has been nestled on the corner of Central Square since 1932. 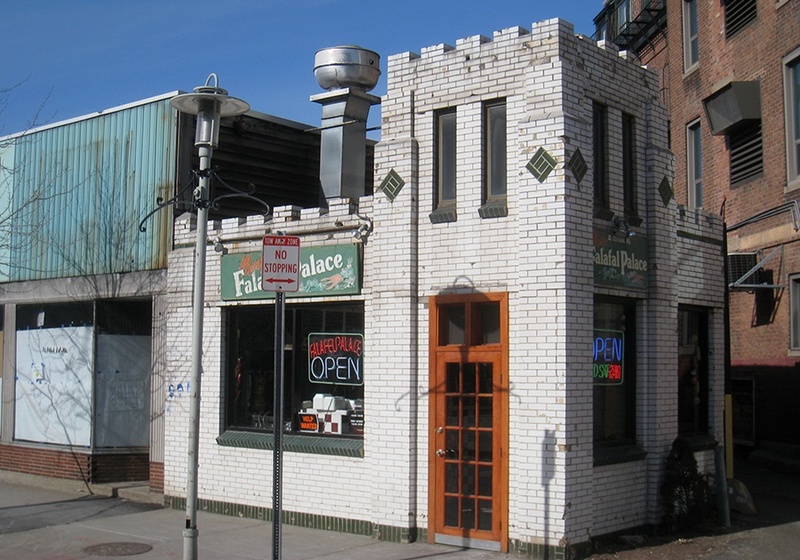 Before most of us knew it as a falafel wonderland, the structure was an original “White Tower” building. No, not White Castle, the iconic burger chain. White Tower was actually a knockoff hamburger restaurant of White Castle, and faced lawsuits from the more iconic chain for its similar uniforms, design, and memorabilia. As a result, they got to keep their name, but had to get rid of visible similarities, which is why according to urban legend, shards of White Tower Hamburgers plates have been found dug up on Spectacle Island, where dirt from the Big Dig was used to cover up what used to be a garbage dump. White Tower Hamburgers died off by the ’70s, but the former location in Central Square isn’t the only spot where you’ll notice a castle-like building design. If you’re ever wondering why 20 Kneeland St. in Chinatown has the same unique design, it’s because once upon a time, that building, too, was a White Tower Hamburgers. Home prices by Zillow, rent prices by Renthop. Icons via iStock.